It’s a routine Wednesday lunchtime and I need to step outside my central London office to get some air. I stand and scoop up the eye-catching carrier-bag under my desk, draping it over my keyboard like a colourful altar-cloth while I put my coat on. This is no ordinary shopping-carrier. to showcase the Vedic perspective on life with a gigantic display of the material and spiritual worlds all under one great roof. That’s a lot to go on a shopping-bag. as it undergoes its final few years’ assembly work. While I don’t normally buy tacky souvenirs (especially not gaudy bags! ), this is no ordinary temple. the mammoth temple’s structurally perfect, if still bare, interior bones hint at finer architectural detail yet to come. 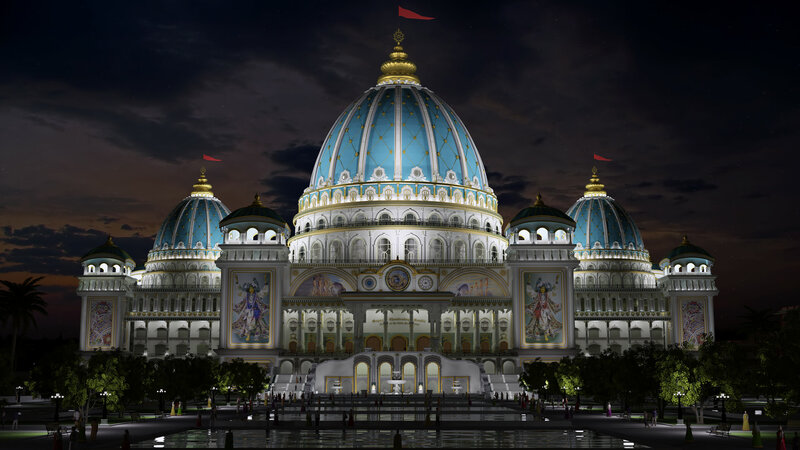 This huge-scale construction project is slowly but surely emerging as the concrete realisation of Srila Prabhupada’s crystal-clear vision, and it’s guaranteed to fire up your imagination. (or cannot) find your passport, money, phone or room-keys, leaving you with a perhaps diminished capacity to wrap your head around the concept of a 3-dimensional, moving model of the universe as portrayed in the Vedic scriptures. ourselves in the rarefied atmosphere of those shrines and sanctuaries already surrounding ToVP. We were mesmerised by sacred music and impressively larger than life deities in Sri Panchtattva Temple main hall. How we marvelled at Srila Prabhupada’s Pushpa Samadhi Mandir – a celebrated memorial shrine to the Hare Krishna movement’s founder, and the largest of its kind in India. of these magnificent creatures’ hearts. Each measured beat brings ToVP slowly but surely nearer to its glorious completion. skies, my phone ran dangerously low. shape of an incredible chandelier, something crucial nonetheless hung in the balance. It was touch and go, and, of course, when night fell I needed that mattress to sleep on. I had to make tough choices. work (*major in London terms). I would briefly resent the Windsors for invading what was, indisputably, much more my regular work-patch than theirs. It’s been a long time since I worked near St Paul’s (and I can just about appreciate its grandeur again without any malingering clouds of misplaced preconception). So it’s all water under the (millennium) bridge. Temple in the late 1960s, when Srila Prabhupada sent them to establish a UK branch of the Hare Krishna movement. Srila Prabhupada gave his first ever UK public lecture at Conway Hall, on Red Lion Square, just opposite where I now work. You could say I spend my working week on original UK Hare Krishna turf, (even if I, sadly, never see bejewelled elephants parading past). be any more visible in the metropolis. etched indelibly on the collective consciousness of both Eastern and Western hemispheres. seemed, the kind of real ambiance we found in much more obscure and far less polished places of worship.) By contrast, we all quickly developed an emotional attachment to ToVP! It was pretty much love at first sight. by the functional frameworks of any nearby office-blocks, shopping centres or high-rises (hopefully this will never happen). of urban life (and, in pulling away on that bus, I concede in hindsight that it never really mattered to what percentage my phone was charged in Mayapur, nor, as it happens, did the amount of chips I may have eaten in one day). When ToVP’s last finely chiselled feature falls into place, the minutiae of daily life around here (and miles away) will be, if not subsumed by a much bigger picture, then at least put into far clearer perspective. us to access unseen realms of peaceful spiritual power.